With a delivery target of over 3,900 homes per annum to 2025, LB Tower Hamlets has an ambitious housing growth strategy, of which Build to Rent is a key component. 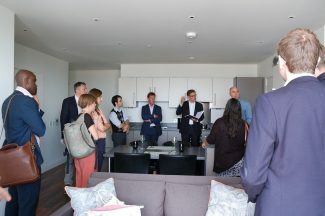 On 6 July, Future of London organised a field trip to Aberfeldy Village, a major estate regeneration scheme in Poplar, with a significant Build to Rent element. With the majority of rental units fully let, the Build to Rent phase has accelerated the overall regeneration programme, as well as helping to foster a more mixed community in a deprived area of London. Tower Hamlets has been the fastest growing borough in London over the past 10 years and its population is expected to increase by a further 20% by 2023. While the borough has an ambitious social housing programme, the PRS is taking much of the strain, and has grown considerably, from 18% of households in 2003 to 39% in 2014. In response to this, the PRS will be prioritised in the new Tower Hamlets housing strategy, due to be adopted later this year, and the borough has employed new staff with a PRS brief. The development of high-quality Build to Rent accommodation is a significant part of this strategy; Tower Hamlets currently has the second highest Build to Rent pipeline in London; its 14 Build to Rent schemes in existence or in the pipeline will provide around 2,300 homes by 2025. 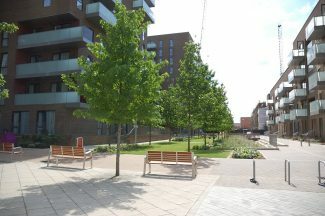 Aberfeldy Village is a key development site within LB Tower Hamlets’ Poplar Riverside Housing Zone. This large-scale estate regeneration comprises six phases, with full completion estimated February 2020. The scheme is a joint venture between Poplar HARCA and Willmott Dixon, with architects Levitt Bernstein and institutional investors M&G. Willmott Dixon’s specialist company be:here are developers and on-site managers of the PRS units (phase 1B, completed Q2 2015), comprising 158 of the total c.1,200 homes. The PRS block is the first new-build private rental scheme to attract institutional investment and arguably the first purpose-built private rental scheme to be let in the Capital. Increasing the supply of mid-market private rent and sale homes helps to create a mixed and balanced community at Aberfeldy, which benefits the residents and local economy. Build to Rent is a valuable component of large-scale regeneration schemes, with the capacity to speed up the delivery process by leveraging an alternative mix of funding. Having M&G on board as investor for the Build to Rent element enabled immediate delivery of phase 1, and brought forward phase 2. Neal explained the delivery structure. Institutional investors M&G were granted a 250-year head lease and fund the build direct with Willmott Dixon’s specialist company be:here. Poplar HARCA took on a 30-year sub-lease. Around 75% of the rental income is paid to M&G, leaving 25% for Poplar HARCA to manage lettings, voids and maintenance. 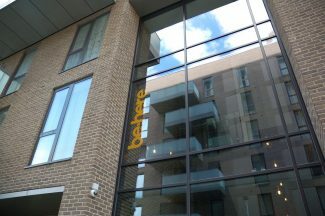 Be:here is one of the first developer operators to let a Build to Rent scheme, and has three more developments in the pipeline. The company’s approach has been informed by extensive investor and consumer research. High-quality management and maintenance, sustainability and a strong community ethos were all found to be essential to both parties. The rental homes at Aberfeldy are in almost full occupancy by residents with an average income of £39Kpa and average age of 28. Tenants have been overwhelmingly positive about their accommodation and service, due in no small part to be:here’s management strategy, which includes an on-site property manager who responds to tenant issues swiftly. The rental units have been designed very differently from the sale ones, which was confirmed by a comparison viewing. The units for rent have a ‘dumbbell’ layout with central, open-plan communal space and bedrooms of equal size on either side, both with en-suite bathrooms, one of which can function as a communal bathroom when required through dual ‘Jack and Jill’ access. Materials, furniture and fittings are hard-wearing and easy to clean. Additional storage lockers are available to rent; other amenities include parcel collection, on-site dry cleaning and a coffee machine. Additional communal areas and amenities, such as an on-site gym, are being considered, though the additional space required is limited on this site. Future of London’s next Build to Rent field trip is 17th August to LB Barking & Dagenham. To register interest, please email events@futureoflondon.org.uk.